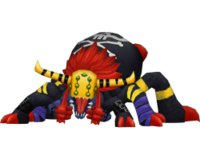 A cursed Digimon in the shape of a spider, whose entire body has been parasitised by a computer virus. 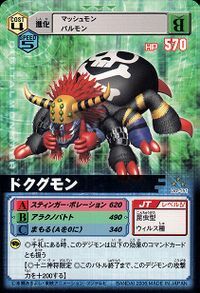 While it was originally a spider-type, it had a docile personality typical of insect-type Digimon; however, at some point, it was drawn into a powerful electromagnetic storm and infected by a computer virus that had been circulating around the Network. Since then, it has become but a lump of poison, or in other words a computer virus, that corrodes anything it touches. Not only that, special mention has to be given to its great movement speed, made possible thanks to its eight legs. No matter how desperately one tries to get away, Dokugumon will never be far behind, and it will not stop its chase until the opponent ceases to continue running out of exhaustion. 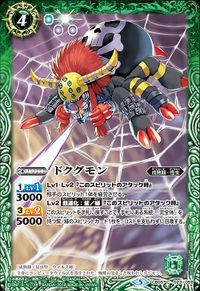 As the opponent stops to take a breather, it brings its opponent down with a fearsome, poisonous attack launched from its vile fangs (Stinger Poration). — Digimon Adventure: "The Chase! Hurry to Japan"
— Digimon Adventure 02: "Follow the Kaiser's Base!" Adult level. A dreadful Digimon who corrodes its opponents just by touching them. Its Special Move is Sting Operation. — Digimon Tamers: "The Meaning of Partner, Renamon Evolves!" 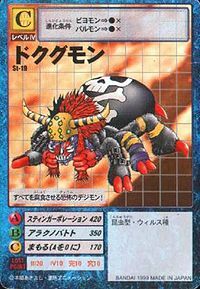 — Digimon Savers: "Memories of my Mother, Howling Mach Gaogamon"
n., From Dokugumo (毒蜘蛛 「ドクグモ」), meaning poisonous spider. Anime/Manga Digimon Adventure: "The Chase! Hurry to Japan"
Stinger Poration  スティンガーポレーション Sutingā Porēshon Poison Cobweb/Venom Blast/Worm Venom Fires a poisonous blast from its mouth. Arachno Batoto  アラクノバトト Arakuno Batoto Poison Thread/Poison Ride Shoots a web from its abdomen. Shoots Kodokugumon at the enemy. Dokugumon is a soldier of Vamdemon and attacks to the Chosen Children in his castle, but Were Garurumon manages to destroy Dokugumon. Dokugumon is one of the Digimon Kaiser's slaves. 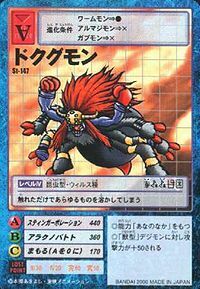 The same or another Dokugumon is later seen as one of Archnemon's slaves. Yet another one appears in Mexico. A Dokugumon is one of the wild ones fighting Ruki and Renamon. Renamon is hurt protecting Ruki, but manages to evolve to Kyubimon and kills Dokugumnon. Several Dokugumon work for Metal Fantomon. Sunflowmon kills 7 of them with one hit, the rest is killed by their master himself. Dokugumon is available as a Digimon Medal. Evolves from Pico Devimon. Can evolve to Lady Devimon or be Jogressed with a compatible Digimon to get Pumpmon or Fantomon. 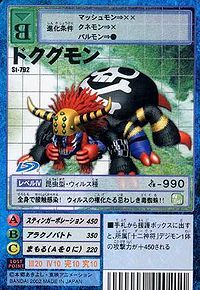 Dokugumon is an enemy Digimon in Area 03, 04 and 05. This fearsome Digimon corrodes everything! It melts anything it touches. Contact with any part of its body will infect you! This unpleasant, venomous spider is a virus incarnate!! 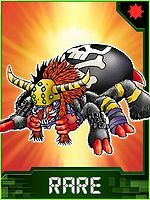 It used to be a docile Digimon in the shape of a spider, but it was parasitised by a virus, causing it to corrode anything it touches. It uses its eight legs to chase its prey to the ends of the earth. 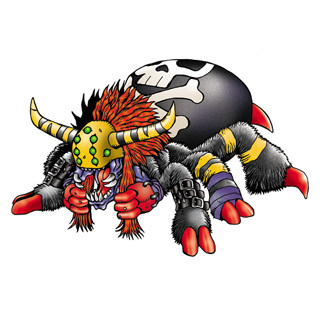 A cursed Digimon in the shape of a spider, whose entire body has been parasitised by a computer virus. This page was last modified on 12 April 2019, at 21:50.